Still Waters was born out a long association and friendship between Henry and bassist Dave Green. They both felt that the time had arrived to play the music of their choice, together with some of the finest jazz musicians working in Britain today. As a result Still Waters is now one of the most accomplished, tightly ensembled and creative bands around. They play radical and original music, ranging from gentle, quietly pastoral and melodic music, through to dynamic, free improvisation. The band features pianist Barry Green whose own trio played such a fine set at the Crucible in 2017. This is part of a tour celebrating Henry’s 75th birthday and there will be a pre-gig talk by him about Miles Davis and his legacy. “For me, Still Waters is the most exciting band I’ve ever had the pleasure of playing with”… Henry Lowther Quite a statement, coming from a man with over 50 years’ playing experience, with small ensembles, big bands and orchestras, of free and composed and classical, with jazz luminary all over the world, from a 45 year association with John Dankworth, soloing in Scott Stroman’s projects, to lead trumpet with both Gil Evans and George Russell, from Woodstock in 1969 with Keef Hartley’s Band to many and continuing years with the London Jazz Orchestra. Henry Lowther’s first musical experiences were through his father and the local Salvation Army band, going on to a classical training and studying violin at the Royal Academy of Music. Shortly after this Henry became interested in jazz after listening to Indian music and, after being inspired by hearing a recording of Sonny Rollins, resumed brass playing on trumpet. During the 1960’s Henry was one of the first musicians on the British jazz scene to experiment with total free improvisation, notably with the famous Cream bassist, Jack Bruce, and with Lyn Dobson and John Hiseman. 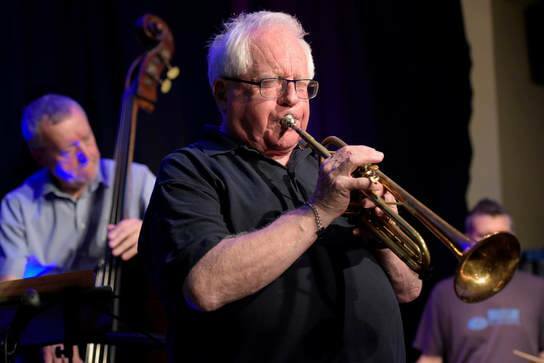 He was a member of the original and seminal Mike Westbrook band and also in 1967 joined the John Dankworth Orchestra, the beginning of an association that was to last almost 45 years. In the sixties Henry also worked on the rock scene with Manfred Mann and John Mayall, and with Keef Hartley, with whom he appeared at the legendary Woodstock festival in 1969. Over the last 50 years Henry’s work on the British jazz scene reads like a “Who’s Who”. He has played regularly with, amongst many others, Gordon Beck, Michael Garrick, Graham Collier, Mike Gibbs, Pete King, Loose Tubes, John Surman, John Taylor, Stan Tracey and Kenny Wheeler and toured in recent years with the Berlin Contemporary Jazz Orchestra, John Harle, Rolling Stones’s drummer Charlie Watts and His Tentet, the London Jazz Composers Orchestra, the New York Composers Orchestra, the Hamburg NDR band and Hermeto Pascoal. He is one of only two or three players in the world to have had the honour of playing lead trumpet with both Gil Evans and George Russell. As well as composing for small ensemble, Henry’s larger compositional activity has been supported by commissions including Rikskonserter and the Jemina Festival in Spain. In 2011 Henry was awarded the prestigious Fellowship by the Royal Academy of Music. Currently Henry writes for and plays in the London Jazz Orchestra, gigs with Still Waters and the Great Wee Band and also performs free improvised music in trio format with violinist Satuko Fukada and guitarist John Russell. Pete Hurt has been a part of the London jazz scene since 1970s, with an international reputation playing with George Russell’s Living Time Orchestra and the Carla Bley Very Big Band. Other large ensemble work included Andy Sheppard’s Big Co-motion band, the London Jazz Orchestra where he is still a member and composer. His 2016 big band album, A New Start, received wide acclaim by critics. Barry Green studied classical and jazz piano at the Guildhall School of Music and Dance and has played extensively and toured with many of Britain’s and America’s finest jazz musicians. The long list includes Ingrid Laubrock, Bobby Wellins, Pete King, Charles McPherson, Brigitte Beraha and, in a two piano duo setting, Liam Noble. In 2011 he recorded a duo album, Turn Left at Monday, with Dave Green. He is a professor of the Guildhall School of Music and Dance. Dave Green is Britain’s premiere bassist for many good reasons. Equally happy playing swinging mainstream jazz with such masters as Benny Carter, the late Coleman Hawkins and Ben Webster as he is working with modern masters such as George Coleman and Sonny Rollins, His longest associations have been with Mike Garrick, Humphrey Lyttleton and Stan Tracey and also with his long standing friend, Charlie Watts. In 2001 he recorded his own highly acclaimed trio album, Time will Tell, with Ian Dixon and Gene Calderazzo. Paul Clarvis is the most versatile drummer-percussionist working on the British jazz scene today. Classically trained, he has performed with all of the major London symphony orchestras, plays regularly with various folk and world music ensembles, and as a jazz drummer has worked with Mose Allison, Herbie Hancock, Andy Shepherd, Stan Sulzmann, Steve Swallow, John Taylor, Kenny Wheeler and Norma Winstone. Meltingly attractive solos, startling originality. 2018 opens with the excellent can’t believe, won’t believe, from the equally excellent Henry Lowther’s Still Waters. The bar is set high. If the rest of 2018’s jazz albums get close to the quality of this truly delightful work then it’s going to be a vintage year. Its beautiful, melodic compositions, superb collective and individual playing and pristine production values combine to make it a British jazz classic. One of the most significant releases of 2018.